I never take much notice of covers but this one – that’s just how Martin is in my mind! 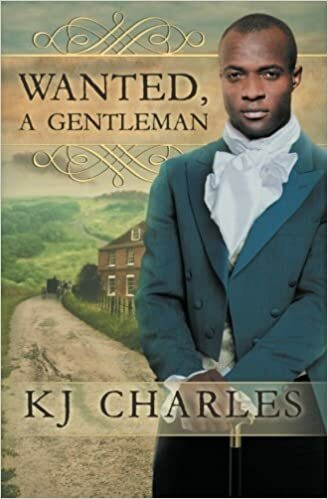 I love KJ Charles writing, love the way she portrays the past with such vivid reality. Her books always make me think too about the issues raised. This is a romance and yet there are serious points in it, slavery and the (im)morality of it, how homosexuality was a crime, debtors prison and the way that impacted on people’s lives, plus of course the whole marrying a title/marrying for prestige and money conundrum. The words too, she’s one of the writers that really uses English to its fullest extent, throws in words I don’t know – I can guess them from the context of course, so its not off-putting – but its fun to look them up, see where and how they originated and ponder on why they fell from use. Gamahuching – that one I’d read before in one of her books but is a wonderful word! So we’re back in time to when a free person of colour was still a novelty. I loved Martin, loved the way he was so angry about his past, and yet he understood compared to others he’d been lucky. Its awful to think of kids being treated like that, and yet back then it was commonplace, and even ostensibly “free” people were treated as disposable in the same way. I really enjoyed the way they talked about it, the way it gave me insights into what kind of people they were, the way it set the whole story solidly into that era where Money and Class ruled. Theo is one of those “free” people who are anything but. He’s scrabbling to make a living, haunted by past decisions, and really living hand to mouth. I was so taken by the attraction between these two very different characters, and the way they came from disliking each other, full of cynicism and preconceived ideas about the other, to lovers. Of course it being a heinous crime back then they had to be so very discreet to avoid being caught, imprison and lose what little freedom they had. When things go wrong, poor, poor Theo, I so felt for him. I understood how Martin felt too and wondered what I’d do if I was either one of them. Its a sad tale and one that was all too common back then. The ending KJ gave us though was just perfect. Stars: Five, I really enjoyed this but as a one off read. Its not got the appeal for me of the Magpie stories which are ones I enjoy re reading, but its still a well deserved 5* read for me.